Are you ready to be taken back to the 90's? 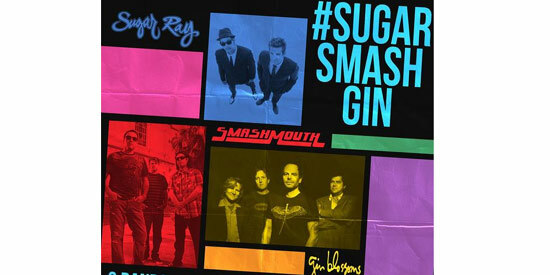 Pop / alternative rock all-stars Sugar Ray, Smash Mouth, and Gin Blossoms team up for a rare one-night only concert in Manila. It will be an evening of pure nostalgia, with nothing but the greatest and most unforgettable hits from the chart-topping bands of the '90s. Smash Mouth will be playing songs including "I'm A Believer," "All Star," and "Can't Get Enough of You Baby." Witness your high school / college crush, Mark McGrath, perform "Fly," "Someday," and "Every Morning" live with the rest of Sugar Ray. And sing-along to "Hey Jealousy," "As Long As It Matters," and "Follow You Down," our all-time favorite Gin Blossoms tunes. So prepare your comfy shoes and vocal chords and let's revisit the good old days with #SugarSmashGin on October 21, 2013 at the Smart Araneta Coliseum. Tickets are now available via www.ticketnet.com.ph or call Tel. No. 911-5555. #SugarSmashGin is an event by Random Minds Production.